What do you own a lot of? You can easily identify one of your “style signatures” simply by identifying what you own the most of in your wardrobe. For me, a style signature is most definitely ACCESSORIES. I love them! I’m never without an interesting bauble or shoe or handbag. Since I continue to acquire new jewelry and purge very little of it, I find I am not able to wear each piece as often as I’d like. My solution? PILE IT ON. 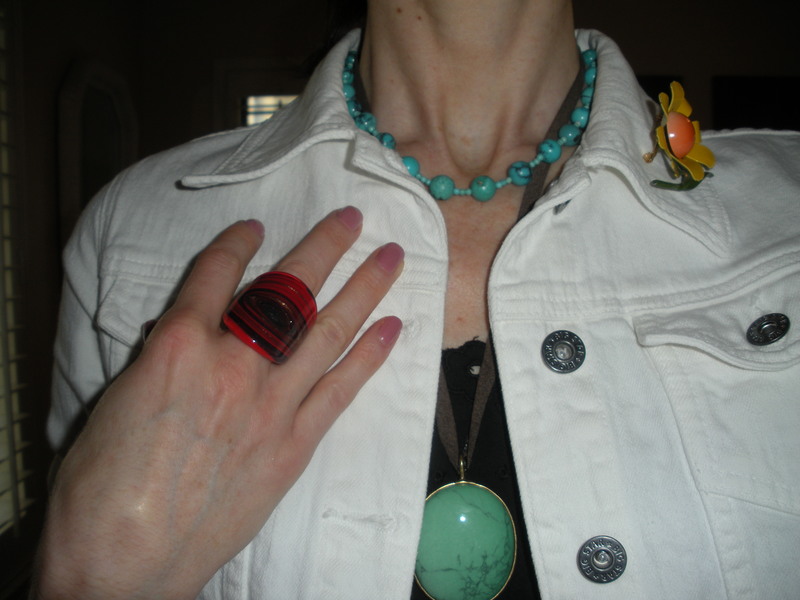 I enjoy layering jewelry, and there is no better time to do it than now. Statement jewelry continues to be a very big trend, one I am more than happy to follow. But even when it’s not a trend, I will still do it! I have lots of fun jewelry to go around and only so many days in the year to wear them. You know that tip by Coco Chanel about taking off one accessory before leaving the house? Rubbish. Perhaps piling on clothes or accessories doesn’t fit with your personal style. Not a problem. The points I want to make are (1) become aware of your style signature and (2) WEAR it. Make a habit of rotating through your style signature pieces. If you love scarves and have quite a few, don’t wear the same few over and over. When you wear one, put it aside and go to the next one. Build an outfit around one if you must. That’s what one does with style signature pieces. Put a new scarf on your handbag each day. Think of new ways to show them off. There is no point in having wonderful things in your wardrobe if you aren’t going to wear them. Your assignment is simple: identify one of your style signatures and start making it part of your look every day.